- Does Kravtsov really write the second book and plan to write a series of books for young entrepreneurs? - Yes, he does. Within the nearest year one more book of Alexander Kravtsov will be published, as well as a book about northern cuisine. - How often does Alexander Kravtsov conduct seminars, what is the subject and how is it possible to attend them? - As soon as Alexander has an opportunity, he conducts seminars for students of economic institutes of higher education, young entrepreneurs and those who are going to start their own business. As usual seminars are held in regions or in Ruyan-city. Our partners in various cities handle arrangements of seminars. If you want to organize a seminar and invite Alexander Kravtsov to your city, please send application to risa@inbox.ru Seminars are always conducted in “question-answer” format, so every participant has an opportunity to get answer to his question and to communicate with the creator of legendary brands personally. - How to get autograph of Kravstov? - At personal meetings with him, follow news on the web-site. 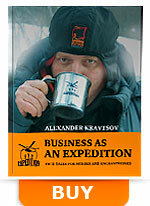 - Where is it possible to buy the book “Business as an Expedition”? On the web-site you can find a map with addresses of over 300 “Expedition” shops, where the book is always available. Besides, it is distributed in bookstore network all over Russia. - If I have a business offer to Alexander, where to inquire?